Mark Elliot Zuckerberg (born May 14, 1984) is an American entrepreneur and philanthropistwho co-founded the social networking site Facebook with classmates Dustin Moskovitz, Eduardo Saverin, and Chris Hughes while attending Harvard University. As of 2010, he is a 24% shareholder of Facebook. A typical Facebook profile consists of a number of different sections, including Information, Status, Friends, Friends in Other Networks, Photos, Notes, Groups, and The Wall. Most of the sections are self-explanatory but some are specific to Facebook. To allay concerns about privacy, Facebook enables users to choose their own privacy settings and choose who can see specific parts of their profile. Facebook requires a user’s name and profile picture (if applicable) to be accessible by everyone. Users can control who sees other information they have shared, as well as who can find them in searches, through their privacy settings. With over 1.5 million photos uploaded daily, one of Facebook’s most popular features has been the ability to upload photos. Users can upload unlimited photos from their cell phone or through its Java-based web interface. Facebook is one of the few services to offer an unlimited quota with their only restriction being a 60-photos-per-album limit – this is much appreciated by Facebook’s college demographic. The process of uploading photos is very simple. Users create albums which they can assign limitations to (e.g. visible to my friends only) and upload photos within them. The album is then put into their profile, and other users with right credentials have the ability to see and comment on them. Facebook also gives the feature to share the photos with a simple web link or send them via AIM() or by e-mail. What’s more, users can also order prints online through a simple integrated interface. Just like every other social network, Facebook has something called ‘groups.’ Users can create new ones or join and participate in existing ones. This is also displayed in their profile and is a good indication of hobbies and interests a person might have. Another Facebook success is their ‘events’ feature, which provides the ability to organize, be part of, and plan for events. This feature has been extremely successful when it comes to organizing parties. Along with organizing and joining events, users can also invite and recommend others to an event. This feature, however, has raised some controversy as it is generally the start of underage drinking and dry campus violations. Colleges and universities use the feature to catch planning of such events before hand and investigate those that are over. In any case, it’s one of the most popular features of the service and even beats some of the competing products made specifically for this purpose. As of August 2006, Facebook has offered a free Developers API called Facebook Developers. This essentially gives anyone access to Facebook’s internals and lets programmers create widgets, mashups, tools and projects based around Facebook. This is an important feature for Facebook since it makes it the first major social network to give access to its API. Although it is limited to 100,000 requests a day, it’s more than enough for a decent web app to come through. What’s more, a selection of applications have already been created. FaceBank is a promising tool which lets you ‘keep track of depts and shared expenses with friends.’ Another interesting application is lickuacious which lets you ‘rank your friends by wall popularity.’ The Wall, of course, is Facebook’s comments feature. Facebook Notes was introduced on August 22, 2006, a blogging feature that allowed tags and embeddable images All notes are displayed in the user’s profile, and other members can add comments. Facebook launched Gifts on February 8, 2007, which allows users to send virtual gifts to their friends that appear on the recipient's profile. Gifts cost $1.00 each to purchase, and a personalized message can be attached to each gift. VKontakte (internationally branded as VK) is a social network service in Russia, Ukraine, Belarus, and Kazakhstan. Because of its design and functionality, VKontakte is often claimed to be a clone of Facebook, accommodating not only a similar concept, but also a comparable business model. However, its incorporation of other features makes it more like YouTube, Pandora, and MySpace rolled into one, with an interface highly reminiscent of Facebook. Since 2007, major Russian companies have been sending job offers via VKontakte. Most of the site's users are university and high school students. However, as the site's popularity increases, more and more people are joining, many of whom are youths of various age groups. Russian programmer Pavel Durov is one of the founders of the social network “Vkontakte” (one of the co-authors of this resource is his brother Nikolay Durov). A winner of the study grant of the President of the Russian Federation, a winner of the study grant of the Government of the Russian Federation, a triple winner of the study grant of Vladimir Potanin, a winner of the academic competition in linguistics, computer science and design. In 2007 he was recognized as one of the winners in the competition “The best young businessmen of 2007″ by a newspaper “Business Petersburg”. In his page “Vkontakte” he says that he takes part in the activity of Mensa community. Pavel Durov is also known as the founder of other, smaller student’s projects, namely Durov.com – a site that is mainly oriented on the students of humanitarian specialties, and SPbSU.ru – a forum of the students of St.-Petersburg State University. In 2006 he graduated from Philological faculty of St.-Petersburg State University. In September, the same year there was a startup of “Vkontakte” – the main Durov’s project as of the present day. In 2008 a new “cover” for the social network “Vkontakte” – Durov.ru was launched with the use of UserAPI which was specially developed for the creation of foreign social networks. History of building a social network Vkontakte is amazing and has a few mysterious moments. No one site in runet, and perhaps throughout the world, can not boast of such a quickly developed, or more accurately say "collapsed" on the project popularity and the growing number of participants. But let's start with a story from the beginning. The main ideological creator and developer - Paul Durov . In distant years 2004-2006 Paul Durov developed and administered student Internet projects. One of the first successful projects was durov.com which were collected answers to exam questions humanities. The site was popular with the sessions, and a good first start Vkontakte was just due to links from the main page durov.com. Over the name of the future of the project thought the whole team were first idea student.ru type, but, while agreeing that everything, sooner or later become graduates, and the main objective of the project - that people would remain in contact with each other, and after graduation … Title Vkontakte invited Paul Durov, the name immediately liked the whole team, but Paul himself Durov doubted this title. But time has shown - in vain. n the summer of 2006 has already worked closed alpha version of the project, and in September of 2006 was launched the beta version with "semi-closed" registration, by invitation only. Draft Vkontakte quickly gaining popularity, but many stopped by the closed registration. Under the constant requests to open a free registration in November 2006, finalized services groups, notes, appointments and opens a free registration. Immediately avalanche starts to grow attendance, passed just two weeks, and bought in July, a powerful server does not handle the load, we are working on increasing capacity. But Vkontakte , at that time was still one of the many projects competing for the best student site, on this, to stop there was a stupid thing, needed additional promotions. And the first such action has become a competition with prizes from Apple (the essence of competition? Looking for information), and in January the site Vkontakte hit the Top 50 fastest growing sites Runet. The main idea of the future of the popular project was "The project will allow students and graduates from various universities and faculties always stay in touch." And looking ahead, the idea of the project completed - now Vkontakte is the most popular online resource for students and graduates. Initially, there were attempts to implement a project on the forums - adding new fields, but well-established rules of the forum - nicknames and avatars are not allowed to approach a life form - Name, photos, places of study, etc. To initiate the collection of databases of educational institutions, faculties, departments of Russia, has been done a considerable amount of work, but it was clear that this is not the general list. Under this system was abandoned the ability to add custom fields. Users have the ability to control the availability of their content. For instance, it is possible to hide one's pictures, videos, and entire pages. Users can also choose who can invite them to join groups, write personal messages, write on their wall, and so forth. It is claimed that the search engines do not index site content. Furthermore, the Russian market's dominating players, Yandex, Rambler, and, to a lesser extent, Google do not link to privacy-locked VKontakte pages, as well as users who choose to open their pages to the general public; in fact, search engines currently provide no indication whatsoever that any user is registered on VKontakte. Unless users post external links to their pages elsewhere, the only way to find a VKontakte page is by using VKontakte's own search protocols. Of course, the general concept of resource Vkontakte is not unique, such as social networks exist in America and in European countries and in China. People all over the world want to maintain contact and communication with their friends, schoolmates or classmates, and colleagues. Historically, it used to be more vocal of the Internet began to develop in the U.S., it is there and the first social networking, one of which is now the world's most popular and is called facebook. It is worth noting that the administration contact never tried to somehow hide the fact that such resources exist. Project founder Paul Durov on portal pages repeatedly appealed to customers, advising them to seek their foreign friends to relevant sites, and even pointed out their addresses. Nevertheless, rumors that the contact - it is not genuine domestic development, and plagiarism continue to exist. Basis for them are similar with similar Web site design. This fact is easily explained: the design of social networks have always been rather minimalistic and is an example of the classical cascade style CSS. Such an appearance of such pages has already become the rule and allows users from around the world, even without knowing the language perfectly oriented to foreign analogues. Change the design in principle there is no trouble, but in time it will take a couple of hours. Another thing - the inner content of the resource: database, web-technology - all this is just the unique design. After all, nobody did not occur to blame, for example, Yandex is that he is supposedly plagiarized the same Google. Meanwhile, the internal contents of Contact are absolutely unique. Administration of the project has successfully cooperated with their counterparts from other countries, no complaints and accusations of plagiarism from them has never been reported. It would seem that FaceBook and Vkontakte very similar to each other, and pursue the same goals, but their approach is so different, and in some cases, even diametrically opposite! We suggest you look at the differences between these two social networks on the example of the table. Maximally open the outside world. Mends that all sorts of obstacles. With pleasure gives the traffic outside (because of what gets even more traffic from the outside). Silences viral tools, believing that if "you want to quickly disseminate information to pay for advertising." First created as a free market environment and the best conditions for business and application developers, they are naturally attracted, and the total for the year competition here has increased so that the first and the second started to pay big money for SE advertising. Bluntly said: want to run a branded application that let's entrance fee and a monthly tribute. And the fact that the size of a tribute to a very large application that has not earned and do not know how it goes - so it's your problem. Makes the application, run, and it works. Application may be closed only if it violates the rules, and it complained users All applications must go through pre-moderation - you never know what someone is there to do, and suddenly something happens! Absolutely open to integration with other services. Found on YouTube videos interesting and want to share it with your friends? No problem, let's link to the video on FB, and friends can watch it right here (without loss, by the way, copyrights, the one who posted on YouTube). You found an interesting video on YouTube and decided to share them with friends "facebook"? No problem, Utena him from the copyright owner of YouTube, with dancing with a tambourine download SWF-file, upload it to "facebook", and only your friends can enjoy the results you infringement of copyright. The creators decided to make another and with the introduction of its currency, enter it, but it does not prohibit other methods of payment. The creators decided to make their own currency, introduced her, and God forbid, you want to take payment not in the "voices" … In this case, from the most VC attitude toward his own currency, to put it mildly dismissive: placing branded applications can not pay the voices that you earned, you can only use the voices that you bought directly from the VC by bank transfer. There is a roadmap, which stipulates any significant changes in service will occur in the future so that businesses can prepare for it, and it was not a surprise for him. Major changes in the rules and introduce services without notice. For example, Hallmark Channel has invested money in creating applications that run it, and that same evening, BK has introduced the rules item prohibiting external links and instantly blocked this application for violation of this paragraph. These social networks as it reflects the essence of the countries in which they were born and live their creators. Facebook represents a democratic independent state which does not want excessive regulation, and that if something is needed, then it creates the conditions that all have been profitable to do so, and vkontakte very reminiscent of the USSR, and Putin's Russia, with its hand-operated "vertical", where orders are given to and everything is controlled by the authorities in person. So the main question of this work: Is Vkontakte plagiarism or not? We knew that Vkontakte and Facebook have the same goals and similar interfaces, but is it plagiarism and what exactly plagiarism is? In the dictionary is the next plagiarism definition: "the unauthorized use or close imitation of the language and thoughts of another author and the representation of them as one's own original work". And to make a conclusion we need to remember some main points of this article. First of all, Pavel Durov had idea of creation this social network before he knew about Facebook. But, on another side, Vkontakte founder does not hide that he was taken Facebook as example for Vkontakte. 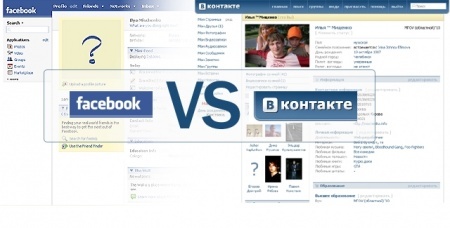 In addition, the later time Vkontakte is becoming more and more similar with Facebook. However, then Facebook added Russian version, and were rumors, that Facebook will sue with Vkontakte, like they started the trial with German social network, but Facebook did not. That should mean something. In conclusion, I would like to say that the plagiarism is too strong word for this and Vkontakte is not plagiarism, it is Russion analogue of Facebook, which has its own history and its own path.